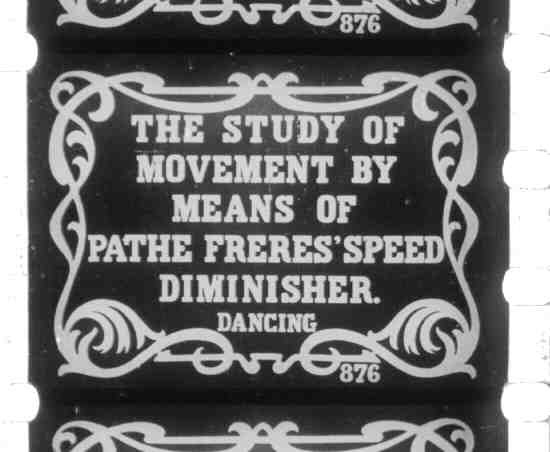 By 1910 or so, Pathé Frères was probably the largest entertainment company in the world. Their phonographs and discs sold at bargain prices, and together with their film industries, had offices and production facilities all over the world including Russia and the USA. By now they owned the rights to all of George Melies films and had bought the Lumiere cine camera/projector patents, having persuaded one of the Lumiere Brothers that moving pictures were 'a passing phase, only good for a quick profit'. Pathé Frères then turned their attention to cinema in the upper class domestic environment. The company sought to reach into an area still dominated by various magic lantern devices - the French bourgeois home. 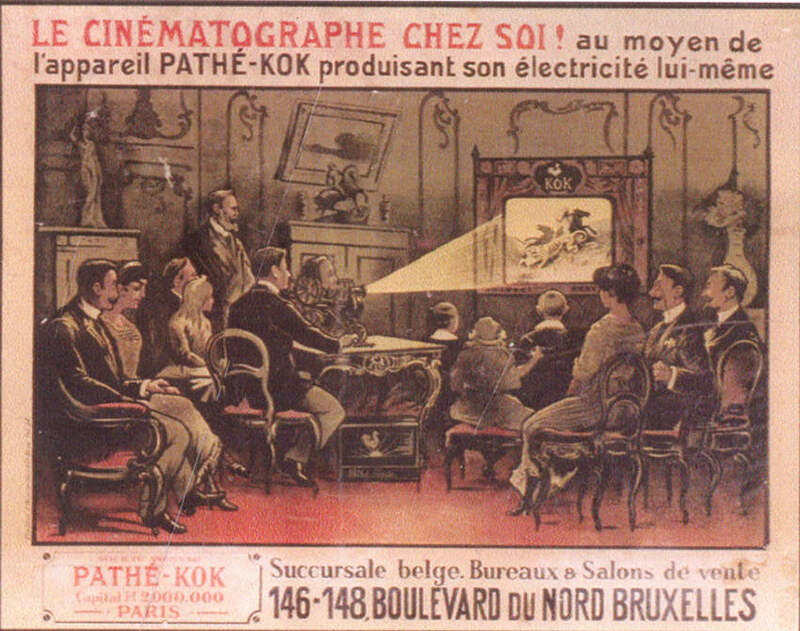 They had shown some interest in the home market from around 1908, but it was not till 1910 that Pathé commissioned someone to develop apparatus for this purpose.There is some confusion who designed the 28mm KOK movie projector for Pathé-Frères, but it was likely George Victor Cntinsouza who was involved with other Pathé equipment design. (It is claimed that Albert Rousell, often credited with the KOK development, was working for Pathé in the USA at the time, but returning a year or so later to help with marketing the KOK). To avoid the use of highly inflammable nitrate based 35mm and also to ensure exclusivity, by way of patents, Pathé Frères introduced a 28mm film size for home use. On a non-flam. base, the 28mm wide film had 1 sprocket hole per frame on one edge of the film, 3 on the other; the large image size of 19mm x 14mm (not much smaller than 35mm) enabled a good quality projected picture. A notable feature of the K.O.K. 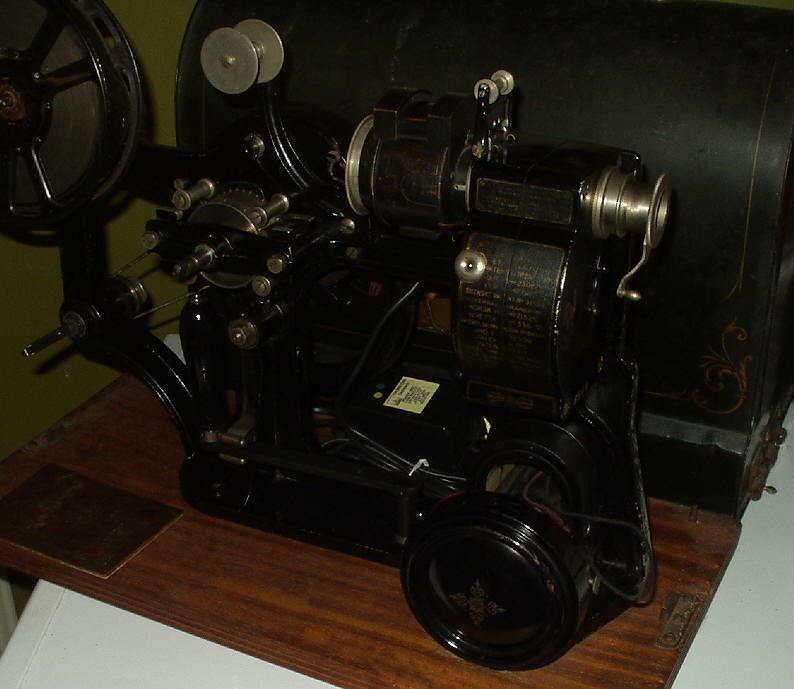 projector, patented in 1911, was dynamo lighting. 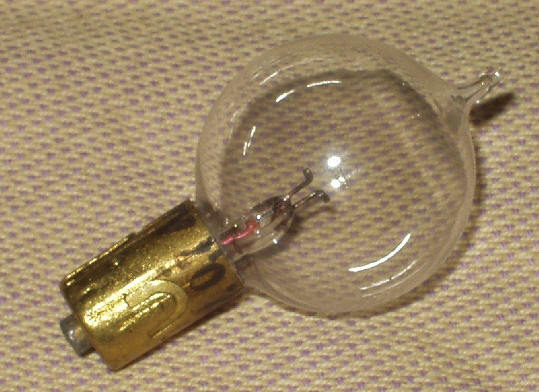 The illumination was provided by a 6volt 0.75 amp lamp contained in a lamphouse similar in design to the later 9.5mm Pathe Baby. The dynamo was driven by a belt from a large flywheel connected to the main shaft. Turning the handle at a steady pace gave a well illuminated 30inch picture. The machine was sold for £15 which included two printed films, a screen, metal carrying case and cleaning outfit. A battery was available for an extra 35/- so that still frames could be projected. used in the ill-fated 1959 9.5mm Pathéscope "Princess" projector. Construction of the K.O.K. was based on a cast alloy central frame to which all the mechanism was fixed and this frame was mounted on a large wooden baseboard over which the metal cover was clipped. Extensive use was made of castings in the K.O.K. and the alloy used was based on aluminium to give stability without excessive weight, so as to allow portability. Spool capacity was about 400 foot (around 7inch diameter) giving up to 8 minutes running time at 16 frames per second. A single sprocket was used to feed the film to and from the wide opening gate. The intermittent motion was provided by a claw which rode back gently on the surface of the film on its return stroke. A single shutter blade rotated in front of the gate, enclosed in a front casing, flicker was visible though not unpleasant because of the low level of the illumination..
A later version of the K.O.K. dispensed with the dynamo and used a dropper resistance, so that the lamp could be operated from AC or DC mains electricity. These mains versions could also be supplied with a motor (fitted in the dynamo position). 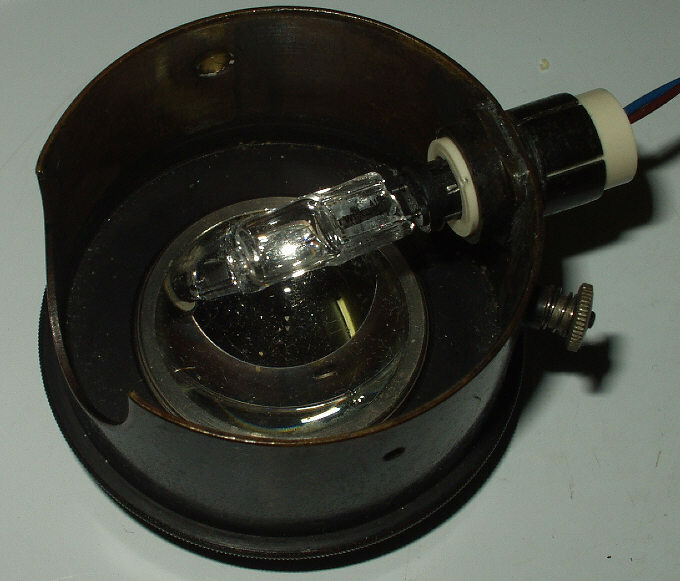 The catalogue states that the type "C" lamp must be used with the mains versions - (from enthusiast Brian Giles we learn this "C" lamp was 12 volts 2 amps - hence 24 watts rating - Brian still has an original lamp and box). The lamphouse on the mains version was somewhat larger and incorporated a cooling vent on top (see the Houghton catalogue illustrations below). It had the same 14mm tubular lamp fitting enabling nowadays the fitting of an MES base lamp or the small Pathé "T" base as used on the later 9.5mm Pathé "Baby" projector and in fact re-introduced by Pathéscope for their "Princess" 9.5mm projector in 1959. (I actually use a 22volt 25watt PR1 Pathéscope "Princess" lamp fed from a separate transformer in my own 28mm KOK with the larger lamphouse and it gives a good picture). One of my 28mm KOK projectors - this has the larger lamphouse and a lovely new baseboard made by an ex-work boss! Having just tidied a vintage 28mm KOK projector to sell for an ex-customer's widow, I realised it would need modified lighting to get it in running order. Here one can see the orginal lamp holder replaced with a modern QI G4 base fitted in a sleeve to fit the existing assembly. Currently I have used a 12 volt 20 watt QI bulb - one of my own machines seems to run at a reasonable temperature with a 25 watt lamp - so this also should be fine. A photo is below. 1. The machines are mounted on a large laminated wood baseboard which has a threading diagram on the front left hand side and the locating pins and catch for the metal lid. Often these laminated wood bases are badly wormed - the picture above shows a very effective replacement. 2. The projector body is a type of metal casting. Try not to put presssure or lift from the top arms - there is a small bracket carrying a feed roller - I have discovered machines with this fractured.- beware! 4. These 28mm KOK projectors seem to have been quite popular - I got my first example many years ago, but before and since, many have passed through my hands. Currently I have four examples here - some have to go!! So I have had at least six examples - many film friends also have them. These are all UK sold I think - perhaps we were all quite prosperous around 1912 in the UK at that time! Sadly the main problem is the 28mm printed films, as they were only in a film library - prints were not for sale. These days they are not cheap - in the Paris film fair asking prices were 400 Euros per reel - one chap who I knew offered me couple at a special price of 200 Euros or so each (too dear for me!!) Later they were all sold! Maybe we need to start perforating some new positive stock to 28mm and printing some new copies .........! 5. FIRE! However don't worry - all 28mm printed films are on an acetate non inflammable base. 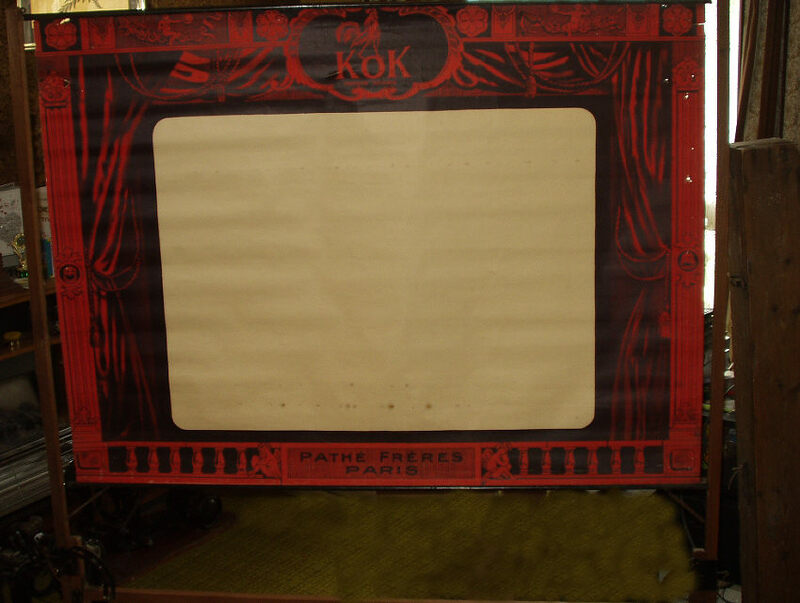 There was a matching Pathé KOK projection screen - this came to light recently (Spring 2015) and consists of a decent wooden box with hinged lid (propped up against the screen on the rhs). The screen is actually tough paper, printed with a centre white area and with the Pathé Frères Paris inprint at the bottom edge. It fits into a light wood frame with two splayed feet and is suspended from hooks at the top and kept taught by springs at the lower edge. The actual screen area is about 30 inches by 23 inches. The whole assembly folds and rolls up into the 4 foot 4 inch long wooden box which is suitably equipped with a carry handle. This interesting piece must date from around 1912! In addition to safety, another advantage of 28mm film was that it contained 20.5 frames per foot, compared to 16 frames on 35mm film. A 400 foot reel of 28mm film is equal to over 500ft of standard 35mm film. Printed films optically reduced from 35mm originals were made available on 28mm. Unlike the later 9.5mm practice of editing the narrow gauge versions to a convenient length, the 28mm versions were issued in their entirety - many films produced from 1905-1914 now only survive in this gauge. The first catalogue offered 48 films from 45 to 90 metres long. By 1920 the catalogue offered 2,000 reels. 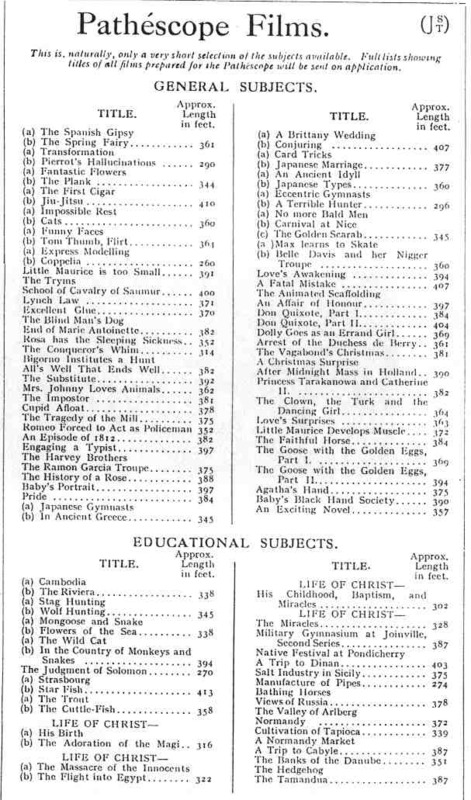 Films were sold at 2d a foot and a library service was also available with 12 subjects a week offered for a subscription of 10 guineas a year. Full length films were issued, and included films from most of the film producing countries. Douglas Fairbanks and Broncho Billy Anderson appeared on this gauge plus some of the spectacular Italian religious silents. The 28mm films were beautifully clear & the projected picture quality was very good indeed. In the same year (1912) came the K.O.K. 28mm camera, quoting from the manual:- "No elaborate directions are needed. There is even an automatic indicator showing just the right speed at which to turn the crank. It is equipped with a fixed focus Zeiss anastigmat lens of 1 3/4 inch equivalent (45mm) with a speed of f4.5. It has a lens cap, a sunshade, iris diaphragm, spirit level, view finder, film length indicator, perforator for marking end of each subject, and contains two film magazines with the unusual capacity of 400ft of 28mm film. Spools of 100, 200 and 300ft length are supplied. Size 12 inches long, 6 inches wide, 10 inches high, weight 12 pounds". 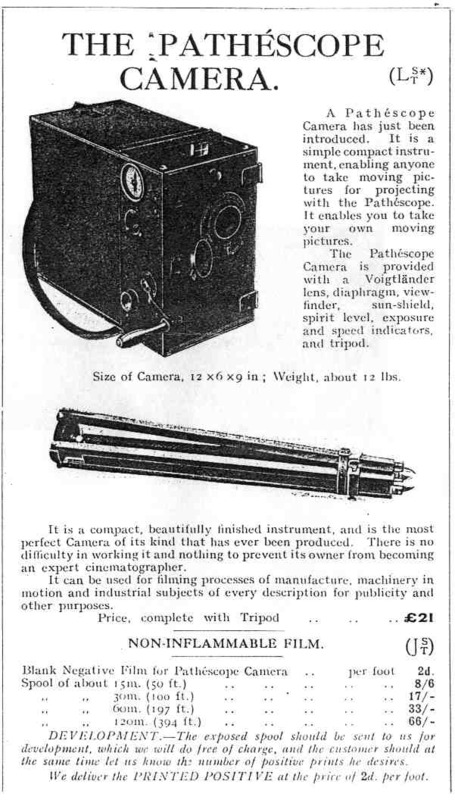 The advertised price of £21 included a sturdy tripod, an essential accessory for this rather heavy, bulky hand-turned cine camera. At the time, the reversal process had not been introduced, so negative (advertised as non-inflammable) 28mm film stock was offered at 2d per foot - a 120 metre (394 foot) spool was 66/- (£3.30). The exposed spool of film was returned to Pathéscope for processing and production of a positive projection print - again at a cost of 2d per foot. The K.O.K. 28mm cine camera was similar to the Pathé 35mm camera, designed to be hand-cranked on a tripod, like most other movie cameras of that period. On the side was a visual indicator which showed when the correct turning speed was achieved. The camera body was made of leather covered wood with a hinged front panel for access to the lens and a rear cover which opened upwards for full access to the entire film compartment. The supply and take-up spools were in enclosed metal drums to permit daylight loading. The main mechanism was mounted on a cast aluminium-alloy centre plate which divided the film compartment from the front mechanism section. 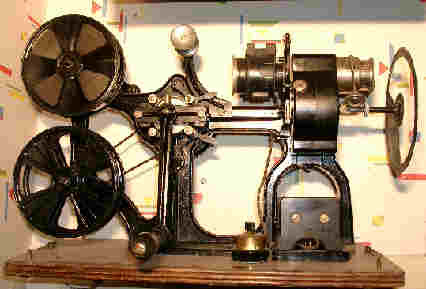 Velvet covered pads held the film in engagement with the chain-driven sprockets, which unlike the projector, were symmetrical with three teeth per frame on each edge. The 28mm negative film had perforations at 5mm pitch on each edge, whilst as already mentioned, the print stock had three perforations on one side and one on the other per frame. (Incorrect threading didn't apply with the camera). It is thought that the 28mm negative camera film was in fact nitrate stock, but only the positive print on safety stock was returned to the user. The side-by-side film loading arrangement required a partly twisted lower loop and a velvet covered guide started the film in this loop as it left the gate. 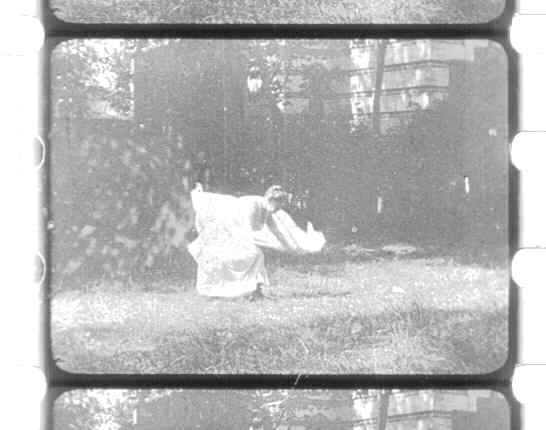 Intermittent motion was provided by a claw pull-down with a single claw on either side of the film. A double cam oscillated the claw frame on its vertical guides, extending the claws on pull-down stroke and withdrawing them on the return stroke. In the front section of the camera the driving shaft was geared to the claw and shutter mechanism and to the chain drive for the sprockets. A supplementary gear train operated both the footage counter and the centrifugal actuator of the speed indicator. 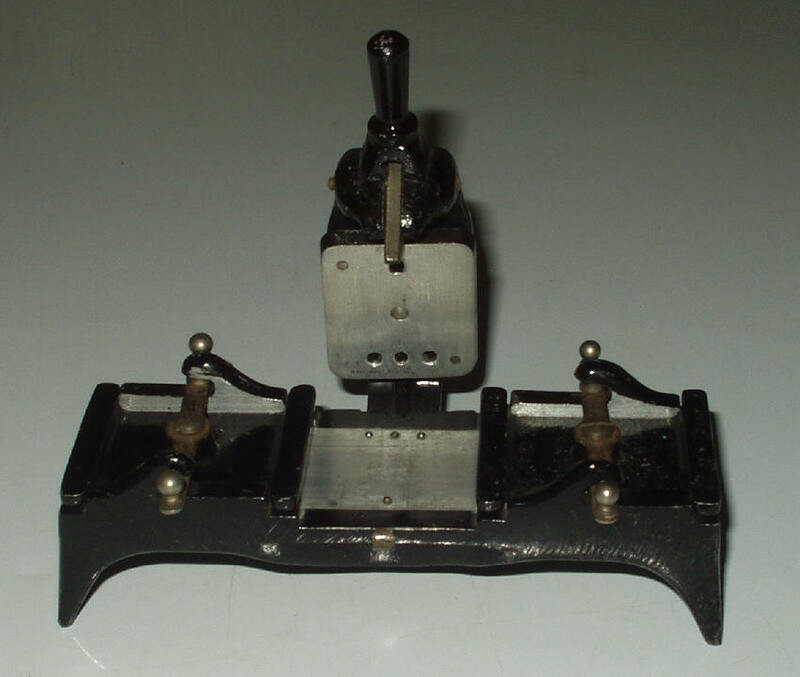 A punch for marking the film was operated by a knob on the side of the front section. On top of the camera the viewfinder comprised a front diverging element with cross-lines and a rear peep sight. Near the front finder lens was a red bubble level. The camera lens, a 45mm f4.5 anastigmat in a helical mount, carried no focussing scale. Set at its hyperfocal distance for normal use, it could be critically focussed if a screen was applied to the film gate from the film compartment. A nice looking piece of kit - maybe similar to that sold by Pathé for use on 35mm - the splicer / joiner consists of left and right side clip-in film grips, with a central press down and clip pressure plate. I guess the film is cut to overlap, the end(s) scraped, then put in place on the splicer, cement applied, and the ptessure plate lowered into place whilst the cement does it's job. There are just a few register pins in the centre, whilst the side channels are labelled "tête" (head) and "pied" (foot) respectively - the French indicates the product was made in France, It is made from a light alloy, mazak type casting - no signs of any deterioration yet - luckily! So far I have only used tape joins on 28mm, perhaps I should give this a try! 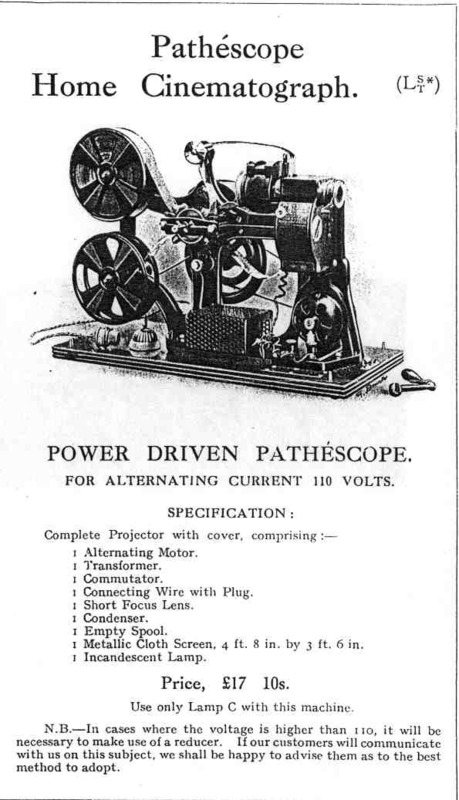 as far as I can see, there is no Pathé marking on this splicer, but I think it appears in the UK sales catalogue. 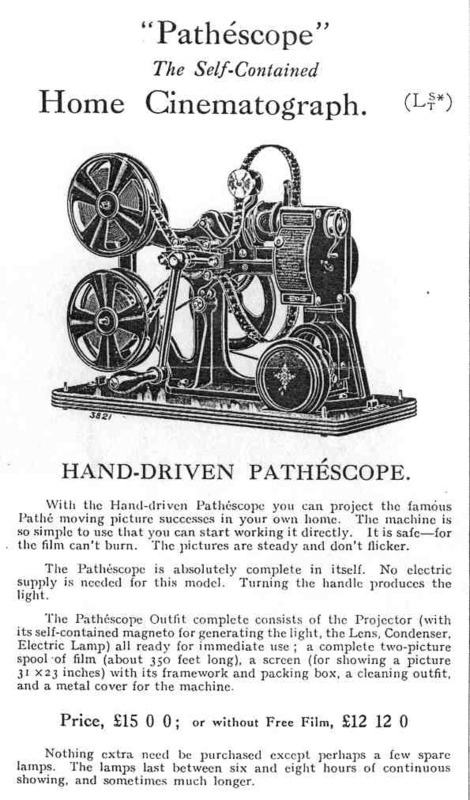 The Pathéscope company was formed in the UK in December 1912 as the agents for the Pathé Frères 28mm KOK projector and the hand turned 28mm camera. Effectively the UK company was what we would now call a franchise - being set up with UK money, but with 10% of the issued share capital value being immediately paid in cash to the French Pathé Frères company who also retained 100,000 one shilling special 'participation' shares - the other 100,000 ordinary £1 shares being purchased by the UK shareholders. This meant that the French parent company also received half of the future profits. 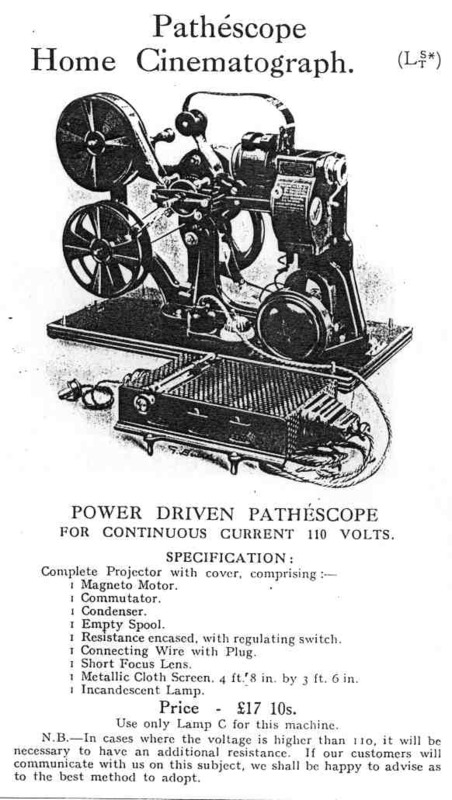 In turn the UK Pathéscope company made Houghton's Limited of High Holborn, their main UK distributors. Within a year (1913) equipment in the 28mm film size was exported to overseas countries like Great Britain and America. The 28mm KOK system proved a commercial success - not only in the home, but in schools, churches and clubs. It was claimed that by 1918 over 10,000 machines had been sold and over 25,000,000 feet of positive film had been produced. However with the worsening of World War 1, production of 28mm equipment in France ceased. But the gauge continued in the United States and Canada. On the dynamo fed lamp KOK projectors I have come across two different lamphouses - one as shown in the Houghton catalogue, the other the same size but with small tubes on top and bottom with holes drilled into the lamphouse to provide some ventilation (I assume this was a later modification, although a model with serial number 2611 has the original lamphouse, whilst others with the serial numbers 2606 and 2738 have the ventilated version lamphouse). A later machine (serial number 6509) has the much larger ventilated lamphouse, but is a dynamo fed version - maybe all later models had the larger lamphouse as standard? Models with the larger lamphouse also seem to have the top film guide roller set further back towards the sprocket (to allow the film to avoid the larger lamphouse). These differences can be seen in the Houghton catalogue - the first hand-turned KOK has the original guide roller position, the others all seem to have the set-back guide roller. Other differences seem to be the drive handle fitting - early machines have a round spindle with a drive peg, later versions have a round spindle with flats at the end. (Handles are not interchangeable). The later model also has a fitting to hold the handle when detached from the drive spindle. I have also seen the KOK metal covers in either black or dark green finish - both appear to be original. 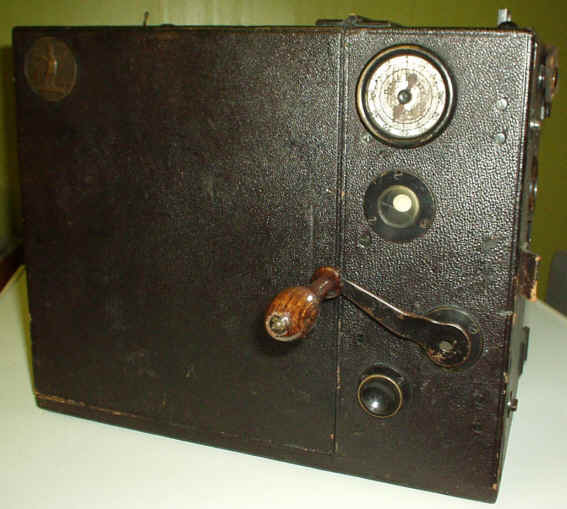 Another interesting variation of the 28mm Pathé KOK is a front mounted shutter (see photos above), this example also has the larger lamp house and a larger lens - I have never seen a model like this listed in any catalogue - was it a special modification and why (the enclosed original shutter casing is still visible)? The Pathé-Frères 28mm KOK when new, was fitted with a geared rewind handle driving the top (feed) spool - it appears to have been normally held out of mesh by a spring for normal use and just pushed into mesh for rewinding. However the large gear with internal teeth was made of mazak (the only item on this projector luckily!) and most examples today are minus this gear wheel. In fact many machines have had the spindle that carried this gear wheel / rewind handle removed altogether, presumably in the hope that the item will not be missed! 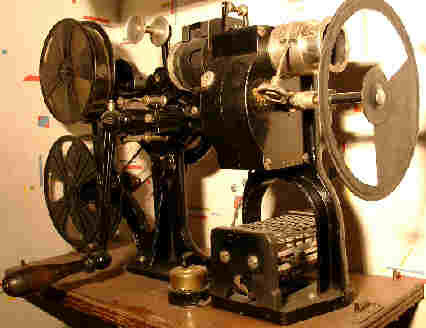 In the USA and Canada in the 1920's other 28mm projectors appeared together with new 28mm film releases. 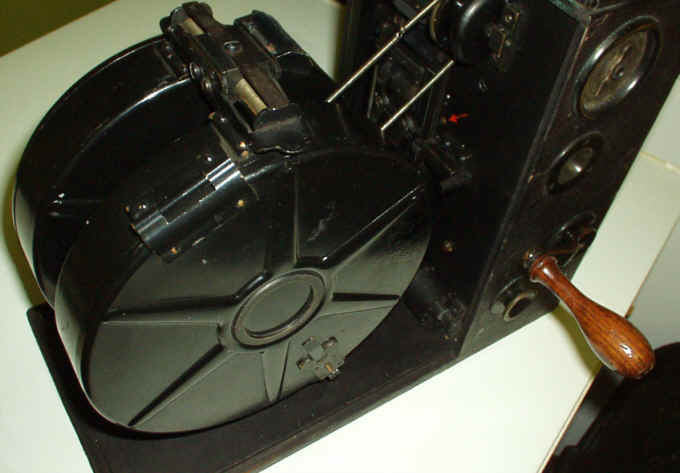 However the early American Victor machines were designed for 28mm films with 3 perforations per frame on both edges, meaning that although the new 28mm films would run on the original KOK machines, the older 28mm film releases would only run on the American Premier Pathéscope but not run on these newer Victor projectors. In early 2004 I was fortunate to be offered a 28mm motor driven American Victor projector. This model and another similar hand-turned one owned by another UK collector both accept the early 28mm Pathé prints. As they do not appear to be modified, one can only assume that Victor decided to risk offending Pathé and designed later Victor models to run either type of 28mm film. 05May2016 - 1913 advert added 31Mar2019 - details of KOK designer changed after email correspomdant info.